This post is sponsored by Bed Bath + Beyond, as usual all opinions are mine. Besides finding THE dress I think the second best part of wedding planning is registering. YES, I WILL go and select a list of fabulous things for people to buy me... haha! The funny thing is that when it came time for us to register at Bed Bath + Beyond we had a hard time coming up with items because, to be honest, we're both 30 something years old and have been living on our own for over 10+ years... we have a lot of STUFF. It wasn't until we walked through the store that we were like "omg, we need this and this and this" - it was like grown-up Disneyland. Not sure if you saw on IG stories a few weekends ago but we had a pretty fun time registering (Andy pretended the scanner was a lightsaber, there was a pillow fight, and some cart racing.) I love that you can register online + in-store with Bed Bath + Beyond because sometimes it's really helpful to see items in person but also be able to add items to your registry from the comfort of your couch. Keep scrolling to see what we ended up getting and my tips for the what to add to your registry if you feel like you already have ALL the things. When you're having too much fun registering for your wedding! Wedding registry must: new silverware! Did you know you can register for WINE at Bed Bath + Beyond? Like I mentioned above with the pots and the crockpot, we used this as an opportunity to upgrade things we already had. ie: Dyson Vacuum! 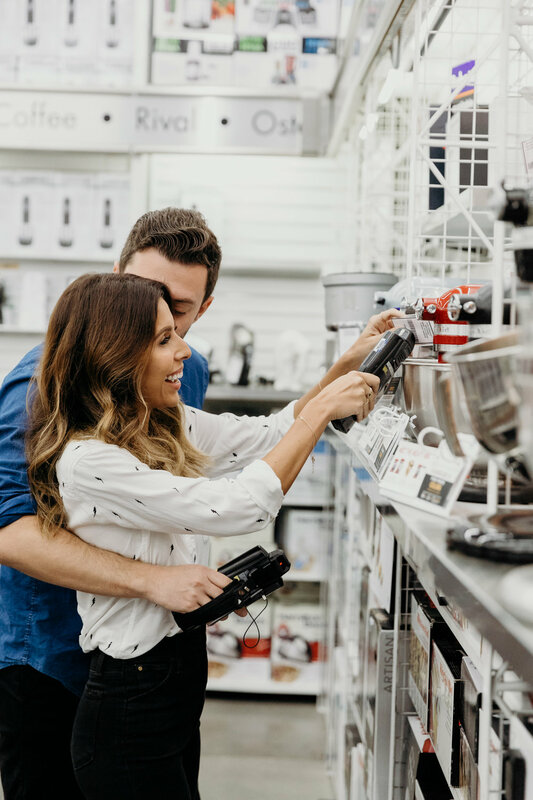 The team at Bed Bath + Beyond is so helpful and hand you a kit when you get there with a registry checklist (you can also find it online) which helps guide you/ remind you of things you may not be thinking about as you shop. On top of that you have an expert consultant there to guide you the entire time! It was great to have her there because Andy is the guy that has ALL the questions about the technology and gadget house items, so I loved passing him off to our expert consultant. May I suggest going first thing in the AM so you feel like you have the whole store to yourself (insider secret)! PS: Schedule your appointment here. We've been really trying to step up our cooking game lately and it wasn't until we started receiving all our kitchen picks that I noticed we look forward to cooking. Who knew that having pans that didn't stick and great knives could be the catalyst for cooking (haha!) It's kind of like having cute workout clothes to entice you to go to the gym. We also registered for new pillows and a down comforter. I don't even want to tell you how old mine is... it was definitely time for a new one. New marriage, new bed accoutrements! Head on over to Bed Bath + Beyond to check out my top 15 picks! Oh and I'm taking over their IG today - check it out. Happy registering, you guys. This post is sponsored by Bed Bath + Beyond, as usual all opinions are mine!